The first installment of ACE Director Souzana Steverding's "Inscriptions in Stone". Romans used inscriptions pretty much the same way we do today. 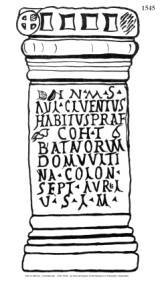 This article shows examples of ancient Roman inscriptions on altars, and gives their translations. ROMAN INSCRIPTIONSI - Altars Roman Inscriptions provide a rich source of information and insight for us into Roman lives. Inscriptions appear not only on Buildings, Tombstones, Dedications, etc., as they still do today, but also on votive altars offered in fulfillment of a vow, to record events, in thanks for well being, success and even amazingly to record a Curse ! Altarstone to the god Mithras at Carrawburgh on Hadrian's Wall --- 3rd century AD ref ( RIB 1545) Reproduced by kind permission of the Museum of Antiquities, Newcastle. "Sacred to the Invincible god Mithras; Aulus Cluentius abitus, profect Habitus, profect of the First Cohort of B atavians, of the Ultinian voting tribe, from Colonia Septimia Aurelia Larinum, willingly and deservedly fulfilled his vow"
Found in 1876, now in Chesters Museum - this attests to the presence of the First Cohort of Batavians being stationed there from about AD 213. 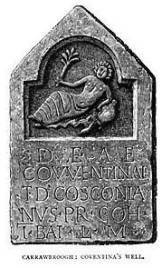 Coventina was a Celtic Water Goddess, whose Shrine - Coventina's Well - and natural spring attracted at the time various altars and many donations including over 13,000 Roman coins. "For the Goddess Couventina, Titus D[...] Cosconianus, prefect of the First Cohort of the Batavians, freely and deservedly [gives this]." "To the goddess Fortuna, Virius Lupus, restored this bath-house, burnt by the violence of fire, for the First Cohort of Thracians; Valerius Fronto, Prefect of the Vettonian Cavalry regiment, had charge of the work." "To the African, Italian and Gallic Mother Goddesses, Marcus Minucius Audens, soldier of legion VI Victrix, pilot in legion VI, willingly, gladly and deservedly fulfilled his vow." Altar donated following a successful Boar Hunt. Dating from end of 2nd Century/ beginning of 3rd Century ( RIB 1041) ... at Stanhope, Co Durham. V(oto) S(uscepto) L (ibens) P(osvit). "To the unconquered Silvanus, Gaius Tetius Veturius Micianus, prefect of the ala Sebosiana , on fulfillment of his vow willingly sets this up for taking a wild boar of remarkable fineness, which many of his predecessors had been unable to bag."